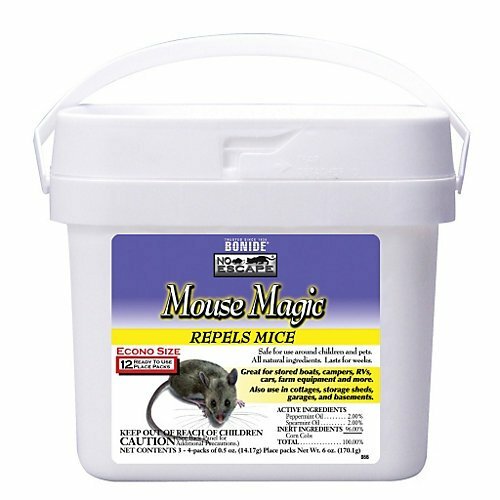 Bonide Mouse Magic 12 pack Bid adieu to annoying mice with the super effective Bonide Mouse Magic 12 pack. Our wide range of insect & pest control products offers you the best solution to prevent and treat insect damage in your garden, lawns or landscapes. This collection ensures you a healthy area that is free from harmful insects, ticks and other nuisance pests. So, choose from our highly effective products, and make the most of a pest-free environment. Product Features: Combines the effectiveness of natural essential oils with place pack technology. The natural ingredients triggers escape. Can be used in homes, sheds, patios, etc. If you have any questions about this product by WETSEL, contact us by completing and submitting the form below. If you are looking for a specif part number, please include it with your message.